"This place would sure hold a lot of hay." If there was ever anyone with a face made for radio, it was Ernest Tubb, with his gaunt death's head leer and creepy hypnotic stare. But he nevertheless managed to develop a musical career that lasted nearly fifty years, through his talent and his ability to work a crowd. This 1987 documentary, shot three years after his 1984 death, chronicles the life and career of the Texas Troubadour. The film, narrated by Johnny 'K' Koval, starts off covering his origins picking cotton, with family members reminiscing about his childhood. The immense influence of Jimmie Rodgers on Tubb's sound is obvious in the blues inflections that were frequently present; he was carrying in Rodgers' footsteps to large extent, being given the Singing Brakeman's guitar by Rodger's widow. The subsequent course of his career touring Texas towns, radio shows and the Grand Ole Opry are covered, including a bit about his brief film career complete with a snippet from Hollywood Barn Dance (1947). There are some shortcomings to this presentation, foremost among them being a complete absence of interview material with Tubb himself. However, a number of his live performances on film and record are included, with some rare vintage material present. 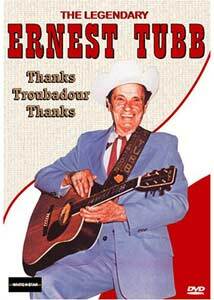 The balance of the documentary is a broad variety of tributes to Tubb, with many greats of country music such as Roy Acuff, Hank Snow and Loretta Lynn paying homage to him. They're joined by a number of the members of his backup band, The Texas Troubadours, who numbered over 100 across the decades. The format is a little puzzling, since it jumps around in time and it's difficult to get a chronological handle on things at times. Tubb's innovations are briefly mentioned, including helping to popularize the electric guitar in country music; the distinctive sound of his band was derived in large part from Billy Byrd's guitar playing. His famous record shop and associated radio program get plenty of attention too. There are some surprising anecdotes here, such as the brief meeting of Tubb with Ringo Starr, who apparently idolized him; it's too bad that the anecdote is related third-hand and not from Starr himself, though. The finale is devoted to the 1982 tribute program An American Original that reveals just how sick the man was. Decades of smoking had led him to a case of emphysema that had him using an oxygen tank in the wings and barely able to labor through a line. His face cannot help but betray how unhappy he is at disappointing his fans by being unable to keep in key. That would be Tubb, devoted to his audience to the very end. Image Transfer Review: The full-frame picture is generally acceptable but not much more than that. The older footage is in somewhat rough shape, while the modern interviews are apparently shot on video with all the attendant softness and iffy color and black levels that one usually finds with such source materials. It's watchable but nothing special. Audio Transfer Review: There's plenty of hiss throughout, including in the modern material. The only clean sound is when Tubb's records arebeing played. The interviews often have obnoxious and extraneous background noise that intrudes into the content. Extras Review: There are no extras. The chaptering is quite thorough. A somewhat flawed look at the Texas Troubadour, but it's worthwhile for the information and the vintage performances by Tubb.